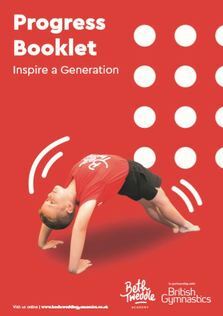 Beth Tweddle Academy Progress Book | Beth Tweddle Gymnastics (formerly Total Gymnastics) Cookies Policy. The Beth Tweddle Academy progress book is free when you join one of our "hub" academies that work with the British Gymnastics awards. Should it go missing, you can purchase another one to make sure your child's awards are kept up to date! Write your child's name on the back and inform your child's coach that it is a new book so they can update the awards!